I enjoy taking unique photos, but I’m not very refined at it. Fake it until you make it, I guess. However, the one I bought is an NTSC model. Growing up in America before the Internet became mainstream, you could easily never know that NTSC was a disadvantage. Since I was in an NTSC region, everything related to video that I owned was NTSC-compatible, and all software in the stores were written with NTSC compatibility in mind. And it never ever seemed like a problem; walk into Target and see a hundred games ready to go with your system. Walk into an actual software shop and there could be double or triple. Actually, I talk about it as if I felt it wasn’t a problem, but I’m pretty sure I never even knew about NTSC, much less PAL, when I was growing up. But the landscape is quite different now. Here I am, actually still in an NTSC region, but with access to the Internet. And being such an old technology, copyright is kinda ignored and you have basically unfettered access to mountains upon mountains of software. And when this happens, you start to realize that a lot of it doesn’t work, and you may wonder why. And the reason is that much much more software was written for PAL. 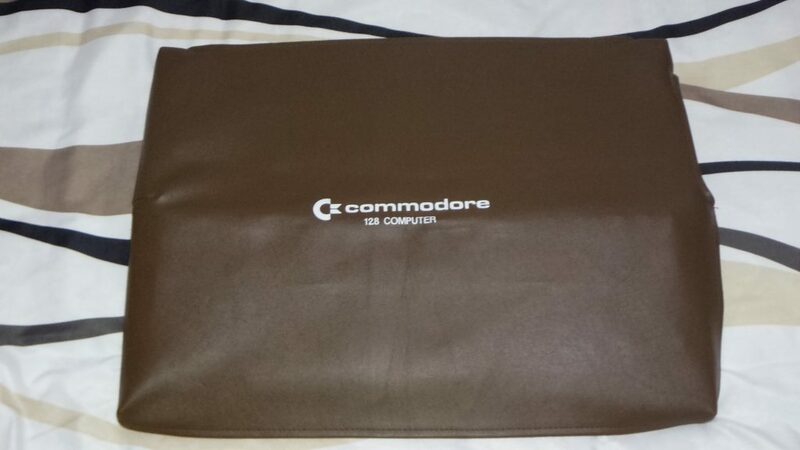 So I bought another Commodore 128, this time from the UK, thus PAL. And I received it, but it wasn’t nearly as nice looking. Sticker residue was the real eye-sore, and of course that will clean up, but on top of that, it was a little yellowed and quite a few keys had small nicks on them. Not wanting to trade my beauty of a 128 for a beat-up one just for access to more software, I exchanged one motherboard for the other. Pretty straightforward process, just a few screws to open the case, two cables and a ground wire to disconnect top from bottom, and a few screws to release the motherboard, repeat, and reverse. Tidy. Now I have a nice-looking AND highly compatible Commodore 128! 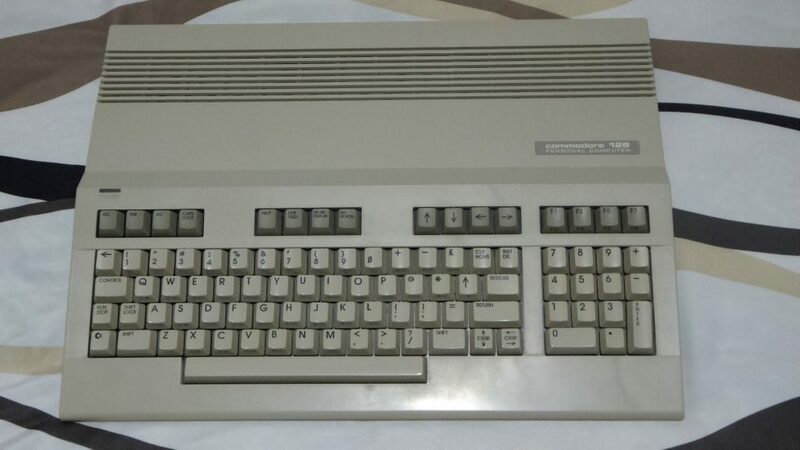 And now that I think about it, I also have a not-so-nice looking and not as compatible Commodore 128! It lives in the closet until I get around to cleaning it up and selling it. And here it is all set up with SD2IEC and Datassette. 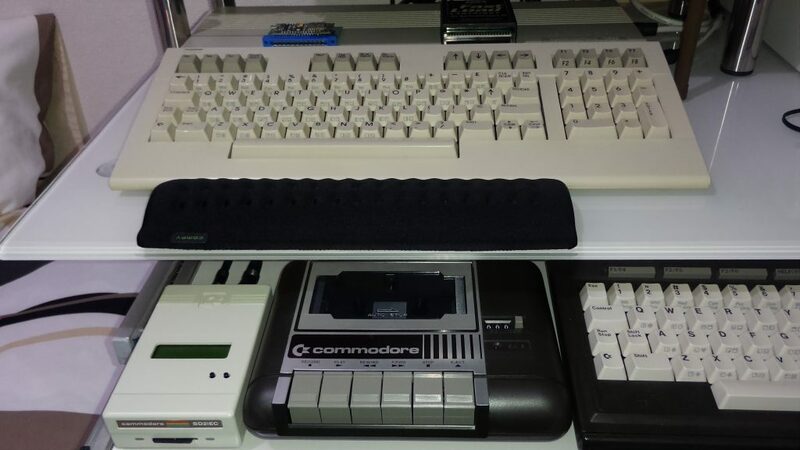 So, why a Commodore 128 instead of a Commodore 64? That’s the more typical choice, right? Well, my first computer was actually a Commodore 64, but I didn’t buy that myself, and it was used entirely for games. After a couple of years, I bought my own Commodore 128 at a garage sale. Sure, it was used, but it was my own money. And it was purposed not only for games (but believe me, there were games) but also for school. Not every teacher at the time would accept a printed paper, but quite a few did, and each paper got input on that system. I feel I did a lot of growing up on that system, so it remains the more nostalgic of the two for me. The Commodore 128 is also a much more sophisticated system. The CPU was faster by nearly double the speed. There was double the memory. The included version of BASIC was much more featureful. It output at double the resolution, if you had the right hookups. There was a second CPU that could load CP/M programs. And there was almost no software to take advantage of any of this! Is what people like to say. But actually there were a substantial number of apps that could take advantage of these features. What the Commodore 128 was lacking was games. This is the rear view, where you can see there are two (actually three, but one doesn’t really count) possible video outputs. The one labeled video is for 40-column video, but the RGBI can output at 80-column, and they can even be run at the same time. But inside every Commodore 128 is 99.9% of a Commodore 64. It was nearly 100% compatible with Commodore 64 apps and games. So while it can be thought of as its Achilles’ heel, because software developers just kept producing Commodore 64 games since the Commodore 128 could also play them, in retrospect another perspective is possible. Commodore 128 native for productivity and the very seldom game, and Commodore 128 in Commodore 64 mode for serious gaming. I’ve heard there are games that aren’t compatible with the 64 mode of the Commodore 128, but I’ve never personally loaded one that doesn’t work. I believe I was given one specific title that doesn’t work, and if that game is a must-have, well, I suppose the 128 isn’t for you. But for me it’s the dream machine! Someday, I hope to use this for actual productivity again. It won’t browse the Internet or display PDF files, but I can use it to type documents and print them, and I can use it to telnet, which could allow me to connect to a modern PC which I can use SSH from, which could make it quite accommodating to do work on. But for now, it’s getting serious use as a gaming machine! Love love love these fake leather dust covers! 次 次の投稿: MAX Machine is alive!